Certificates and plaques of recognition were awarded to 40 seafood vendors who are helping local and federal fishery managers better understand American Samoa’s commercial fishery. 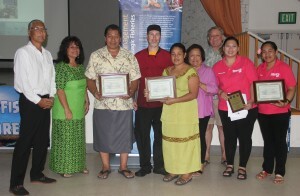 Pictured (from left) are Council Chair Ed Ebisui Jr., American Samoa DMWR Director Ruth Matagi-Tofiga, Aukuso Gabriel of Josie’s Restaurant, Charles Nelson of Equator Restaurant, Hana of P n F Mart, Council Executive Director Kitty Simonds, Tom Drabble of Sadie’s Hotels, and Michelle Shaosxia Ma and Tua Agalelei of Sunny’s Restaurant. UTULEI, AMERICAN SAMOA (23 October 2015) The bottomfish annual catch limits (ACLs) in American Samoa, Guam and the Commonwealth of the Northern Mariana Islands (CNMI) should be equal to their acceptable biological catch (ABC), the Council deemed yesterday as it concluded its two-day meeting in Utulei, American Samoa. The ABCs are set by the Council’s Scientific and Statistical Committee and refer to the amount of fish that can be harvested without causing overfishing. The amounts are 106,000 pounds for American Samoa; 66,000 pounds for Guam; and 228,000 pounds for CNMI. In making its decision, the Council determined that the difference between recent harvest levels and ACLs in all three island areas were sufficient to ensure the ACLs will not be exceeded. The Council yesterday also approved the proposed management policy, goals and objectives for the American Samoa, Hawaii, Mariana, Pelagic and Pacific Remote Islands Area Fishery Ecosystem Plans (FEPs), which are undergoing a five-year review. Theproposed policy is to apply responsible and proactive management practices, based on sound scientific data and analysis and inclusive of fishing community members, to conserve and manage fisheries and their associated ecosystems. The proposed goals are to 1) Conserve and manage target and non- target stocks; 2) Protect species and habitats of special concern; 3) Understand and account for important ecosystem parameters and their linkages; and 4) Meet the needs of fishermen, their families and communities. The National Marine Fisheries Service will review the draft plans to provide comprehensive agency feedback, input and guidance by mid December. During its two-day meeting in America Samoa, the Council also maintained its recommendation made in June to specify the 2016 US longline bigeye tuna limits for the three US Pacific Territories at 2,000 metric tons (mt) each. Up to 1,000 mt per territory would be authorized to be allocated to US fishermen through specified fishing agreements authorized under Amendment 7 of the Pelagic FEP. The Council recognized that these limits are consistent with the conservation and management framework of the Western and Central Pacific Fisheries Commission and are not impeding international conservation objectives to eliminate bigeye overfishing. Recommendations by the Council that are regulatory are transmitted to the Secretary of Commerce for final approval. The Council also directed staff to request that the Department of Justice consider directing funds received from fines and penalties from marine pollution violations that occur in waters of the Territory of American Samoa or in the US exclusive economic zone waters around American Samoa be provided to the American Samoa government. The funds would be used to support conservation and management activities identified in the America Samoa’s Marine Conservation Plan. The Council officers for 2016 were selected and will remain the same as this year, with Edwin Ebisui Jr. of Hawaii as chair and Michael Duenas (Guam), John Gourley (CNMI), McGrew Rice (Hawaii) and William Sword (American Samoa) as vice chairs. The Council also appointed Mike Tenorio to the Scientific and Statistic Committee; Peter Crispin to the Pelagic Fisheries Sub-Panel and Nonu Tuisamoa to the Ecosystem and Habitat Sub-Panel of the American Samoa Advisory Panel; Daniel Roudebush to the Ecosystem and Habitat Sub-Panel and Geoff Walker to the Pelagic Fisheries Sub Panel of the Hawaii Advisory Panel; and Archie Taotasi Soliai, StarKist manager, to the Fishing Industry Advisory Committee. The Council provided certificates of recognition to 40 seafood vendors who provided their monthly receipts of fish sales to help improve understanding of American Samoa’s commercial fishery. Vendors who submitted 100 percent of their receipts each month for the past year received special plaques of recognition. The project is a partnership involving the Council, NMFS Pacific Islands Fisheries Science Center and the American Samoa Department of Marine and Wildlife Resources. For more on the meeting, go to www.wpcouncil.org, email info@wpcouncil.org or phone (808) 522-8220. The Council was established by Congress under the Magnuson-Stevens Fishery Conservation and Management Act in 1976 to manage domestic fisheries operating seaward of State waters around Hawai`i, American Samoa, Guam, the CNMI and the US Pacific Island Remote Island Areas.